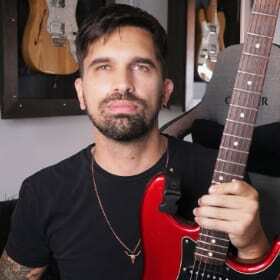 Im Tucker Green, 33 years old, and a beginner on guitar. I'm from Sundown TX, grew up in a ranching family, which is why in about a year and a half I will graduate with an MBA in Accounting. Thus, casterating calves and tagging bore goats will no longer be included in the scope of my job duties. I look forward to placement with an accounting firm where I will begin a fulfilling journey everyday staring out of an office cubicle in long intervals, watching people walk by and wondering why I'm not Indiana jones searching for lost relics in far a way lands. What I want to accomplish: At 20, to play like SRV. At 25, I knew 3 chords, and Satriani was who I would become. At 30, I pawned my guitar. NOW: To play power chords hard and fast in ultra power metal rhythmic fashion, and chilling grooves - over and over repetatively at extremely high volume, with the most devistatingly wicked drum machine thumping the walls to the point of structural weakness, here and there stream off on some kind of whippin' lead, then right back to the fantastically insane power chord riffs comming off so fast and hard, that at some point the atomic molecules of my guitar burst out from within! I love this site, So glad to have a guitar again, and complete forum that offers a sense of community, support, and fantastic opportunity to learn! Hey Tucker, welcome to GMC - loved the intro !! I must admit that you're previous ranching life sounds pretty cool !! If you're beginning your steps on learning some metallic power chords may I recommend having a look at some of Lian Gerbino's work. He's done a lot of varied metal based lessons which are intended to be manageable and not insane ! I've got an ongoing weekly course running called Guitar Bushido, with 3 levels of difficulty..
Feel free to jump in ! Ahaha, fantastic riffs sir!Already started on 'em... I don't really don't have the tech skill to work up a response video and post it, if I knew how that would be a great project to get involved with. Gah, I should reall consider upping my tch skills Thanks for the welcome! Hi Tucker!! Welcome to GMC! I'm working on Power Metal lessons... you can already find the Helloween Style lesson and there are more lessons on the way! It would be really good if you can record yourself in the near future. It will allow us to help you with some feedback! I'm also giving Vchat lessons every Fridat at 19 hs at the Chat Forum. Welcome man ! You're in the right place . The important thing is to have the will and patience and it is always rewarded. Choose the style, the kind of lessons (all are graded), and we are here for you to give the necessary instructions !!! I'm in the same boat as you when it comes to upping my Tech Skills! I'm getting there slowly and if I can do it anyone can!! 'Giving Up' phrase. So,"You can do it" works as much as you're willing to put yourself in it ! hmm you mentioned......awesome power chords and crazy leads? Gosh Sinisa, This may offer some gratification, I very much hope it does; I used to be a very "can't do it" person, which spelled the end to so many opportunities to grow and enrich my scope as a human being. Well, thanks to the patience and fortitude of one special person, during a difficult set of events, that attitude was stripped away from me, and I am so grateful to that person and always will be! You sir, are planting seeds and quite possibly changing the lives of many "can't do it" students, who are encouraged by your encouragement, and then see they can do it! Ah man, more motivators would be good for the world, for real haha! Hopefully for you. I spent about the same time studying but can't say it improved my ability to fund a shopping spree. Welcome aboard man, glad to hear about your motivation! Keep practicing and rocking! Haha crack me^!! Yessir, I'll have two MBAs, one in Economics, and one in Accounting. So, I'll be qualified to get a promising career going with an international company, travel the world, and be become a super success, or... as assistant manager of a Pizza Hut, haha! Lol, I guess no matter what happens, I'll end up going over my budget on equipment a little more often than what would be considered wise! Man, I have to say, just the fact I have been fortunate enough to have my pawn shop guitar and amp right now, and a membership here, makes me about as happy as I can be. Thanks for the welcome good sir! I know what you mean Tucker . Weird bit for me is I have an MBA and a PhD amongst other things but earn less now than when I only had a BSc.